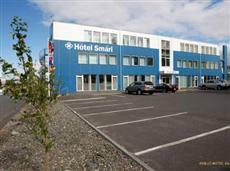 Hotel Smari is a new fashionable three-star hotel in the heart of a buisness area of Kopavogur (suburb of Reykjavik). In the neighborhood is Smaralind, Iceland's largest Shopping Centre. Hotel Smari offers 45 well furnished rooms with privare facility and all the basic equipment, e.g. TV, phone and hairdryer. Wireless Internet connection is available in several rooms as well as in the reception and the breakfast hall. Hotel Smari is a friendly hotel where emphasis is based on personal assistance and comfort. From the Keflavik international airport is a 45 min drive to the hotel and 10 min drive to center of Reykjavik.